A friend of mine (himself an engineer) used to narrate a story about his going to visit a distant relative during Ganapati. His teenaged nephew declared a firm intent to pursue his education in the IIT’s and was soon to begin preparing for it. Commending him on his ambition, my friend offered advice on the various fields within engineering with a view to helping his nephew make a more informed decision. That was when the lad informed him that he wanted to be a bestselling author, and apparently going to IIT was now a pre-requisite for that. It is, of course, a trend now for high-achievers in academics and the corporate world to fancy themselves able to write good fiction. The mushrooming of vanity publishers in India might in fact indicate that this ambition is not the sole confine of the high-achievers either. Let us not forget that my friend’s nephew was not driven by affinity for art so much as the desire to be a ‘bestseller’. So when the ‘About the Author’ section of Rain begins by saying that Mr Sriram Subramanian is an alumnus of not only the hallowed IIT, but of IIM as well, one can be excused for thinking it will fall into the same category as the work of his peers. Mercifully, one would be mistaken. Rain is told primarily from the point of view of Jai Dubey, an architect settled in Pune and married to Sarika Patwardhan, a research scientist. An encounter with a fortune-teller prompts Jai to make a rash declaration of intent to build a house for his family, and he finds himself increasingly conflicted between his intent to fulfil this ambition and stick to his principles. At the same time, Jai is disturbed by an apparent gap in his memory, a brief moment of his early life which he does not remember, no matter how hard he tries. As Rain takes us through the likely and unlikely turns in Jai’s life, we do find answers, even if they are not answers to the questions we started by asking. Rain is about the conflict between principle, the competing hierarchy of need and desire, the strands that hold together a relationship. But it is also about the little things that affect our lives, a delayed monsoon, a nail that is an inch longer than it should be, a race against time and flailing against the Gods. And finally, it is about acceptance as well, about understanding limitations and questioning the unproven. Mr Subramanian’s able to draw realistic characters, not just the main protagonists, Jai and Sarika, but the latter’s family, comprising her parents Ganesh, the ham-radio enthusiast and Mallika the tough-as-nails Marathi matron and Ashok her loutish brother. 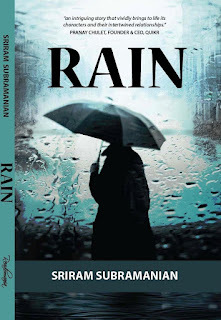 Other characters like Ravi the college friend and Raju the urchin are also drawn from real life, and one can safely say that each individual in Rain is a reflection of a person the reader has known at some point. It is difficult to put into words how refreshing it was to read Rain purely from a language perspective. The word usage, the sentence construction, the flow of words, the felicity with which Mr Subramanian brings his story to life is commendable. There are even a few places where the language allows itself to reach even greater heights, a lyrical flight of ideas and words. From a story and plotting perspective, there are places where a straight line has been drawn from a point to another where real life and a higher form of art might have demanded a more sinuous movement. Perhaps for a debut novel and with due consideration to the commercial aspects of writing, this was a choice the author made consciously. There are a lot of things to like about Rain, even if the book’s blurb flirts with being misleading and the ending is a bit rushed. Certainly, I came away feeling that Mr Subramanian has an ability to express himself that will stand him in good stead as he grows as a storyteller. 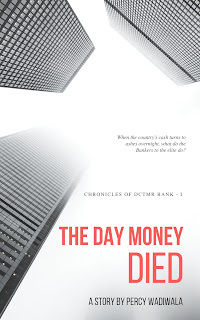 I read it in almost a single sitting, and given that this is not a conventional thriller / suspense novel, this speaks volumes for how well the author has knitted the story. Wow, thanks Percy! High praise indeed, coming from you. I think I can safely consider it my greatest achievement that not one of the characters in Rain is a real-life person I've known; they're all entirely fictional. Certainly, Jai has a lot of me in him (in terms of core values and reactions, not the external trappings), and I've seen some aspects of some of the characters first hand in some people, but that's about it. Ganesh for instance, is entirely aspirations - he is what I would like to be, when I'm 60. Happy to discuss the improvement areas (and there are many, I'm sure) - privately, and at leisure, perhaps in person. A big thank you, once again! I said 'reader has known', by which I meant that anyone who reads the book should be able to relate its characters to someone real. A good writer always draws on real-life persons, but the really good ones are able to draw composites who are real without being mere caricatures of the person they are based on. 'reader has known' not 'writer has known'...facepalm! You're absolutely right of course!! Apologies.